All categories get a score! They are out of 100, with usual school grading applying wherein 75 is a straight up "C" and everything under 50 is just there to express various levels of pique. Dave and I drove back the way we came and headed north on Central. This is a very interesting street, not so much architecturally, as it's just big and retail, but it's super multi-ethnic and diverse and all that. There are quite a few Central American, and Middle Eastern restaurants, but also a very good Co-op. I had a wrong address for the library, but as the jeep gripped fanatically to the road surface Dave was easily able to adapt to our sighting of the library (earlier than expected, on the left) and get us into a parking lot in the back. The library was newish, with a pleasing enough contemporary industrial design. Dave commented positively on it inside which made me look more favorably upon it and all its metal beams and wood and skylights. I liked how the library just fronted right up on the sidewalk and I was aware how rare it is that I find a really urban library that fits well in a commercial district without setting back more from it. I guess I'll go swipe a picture. I'd credit the photographer but I couldn't figure out who it is. That whole arrival thing covers a lot of the building. I'll add more about inside. The library was a very open plan, and there was something a bit static about its layout design, but this is something I feel a little ill-equipped to judge. I know there's that balance of needing to keep things very public and visible so that people are less able to get up to trouble, but the nooks and diverse spaces are what can make libraries so appealing and interesting. This library had a massive, not very friendly security guard roaming the space and a desk set up that really seemed designed for keeping an eye on things. So, while I was not keen on it, I also don't know what kind of chronic problems they've experienced there. The desks looked onto the entrance and the banks of computers that dominated the center of the library and caused me to coin the phrase "Computeraries" which my computer does not yet recognize as a word. I know internet access is huge for today's libraries but I'd love to see those growing banks of terminals integrated into the design better, perhaps more discreetly. As to public art I didn't see anything of any note, which seems especially sad considering its culturally rich neighborhood. This had a surprising impact to me because it really made the building feel uninvolved in the community. Number of Agatha Christie books on shelf: 36, really quite good for a smaller to medium branch. One wanders into the only thing that could slightly be called a "wing", sort of in the back right of the library, to easily find the bathrooms. From the security guard and the feel of the library I'd think they'd be combating junkies shooting up in there and that the bathrooms would thus be pretty rough, but no! These were individual use bathrooms in super nice condition. I was inspired to even use the bathroom! My only small complaint is that the Hennepin Library System apparently uses the cheapest, most flimsy paper towels ever made and their dispenser jammed after some strange partial piece of towel dissolved on my wet fingers. Ah well, it is more ecologically friendly to dry my hands on my pants anyway. Can I hang my flier for my blog with a sticky note on it saying "this library to be reviewed soon!"? 5 blocks south is a place called Diamonds which I am actually curious to try, but have not yet had the opportunity. For now this seems good enough. You can probably get fairly good coffee at the nearish co-op too. Do they have The King of the Schnorrers by Israel Zangwill. First, I should say the librarian desk person was oddly at the side of said desk, like the desks were something to be avoided. She was working on a small laptop perched on a partition. To help me she moved back to the computer on the desk. I had to spell "Schnorrers", though I recognize this is not unreasonable. They didn't have it. I was offered no further options. Interest, Interlibrary loan options, and or commiseration all would have done much to improve the score here. How many books are there in the entire collection? She sort of laughed and said "No." (I can't remember, was my question "Do you know how many..."?). Then, in that 'oh yeah, I'm supposed to be a librarian' way that was starting to become familiar, she added "There's over a million in Central." So, a lot, but not King of the Schnorrers. What does she think of the Pierre Bottineau Library? She did pretty well here. She said it was quiet and quaint. We chatted briefly about its circulation, which was low. She had an opinion and shared it. I didn't get any inside scoops though. Sadly Dave did not try again for a card and I didn't do anything at Circ either, so I am cautious about judging too hard. What I took to be the Circ Man was standing a fair bit back and sideways to the desk, in conversation with someone for what seemed to be the whole time we were there. Oddly the staff struck me as treating the desks, which seemed nice enough and well enough situated, as faintly contaminated. Circ may have been great if we engaged him, who knows. So keep in mind we go on very little here. Okay, once again I'm going to get way too emotional here. I looked for Blood on the Tracks by Bob Dylan. This is arguably the greatest album by, again, arguably, but it's a good argument, the single most important artist of any kind of his generation, who, it is important to note, actually recorded this album in Minneapolis, with local musicians. In Minneapolis! And they have like 3 or 4 copies total in the collection. Of course they are all checked out! Yes I am giving into a fit of pique once more, but geez, it's like if the Stratford upon Avon Library system didn't have Hamlet. "Yeah, but it's in a book of his collected plays, we've got a couple of those. But, hmm, looks like they're checked out." Actually, I wrote this, then went to the Stratford upon Avon website and checked, and I'm really not sure this isn't sort of the case. I can't quite tell, but if it is they get the same score here as below! 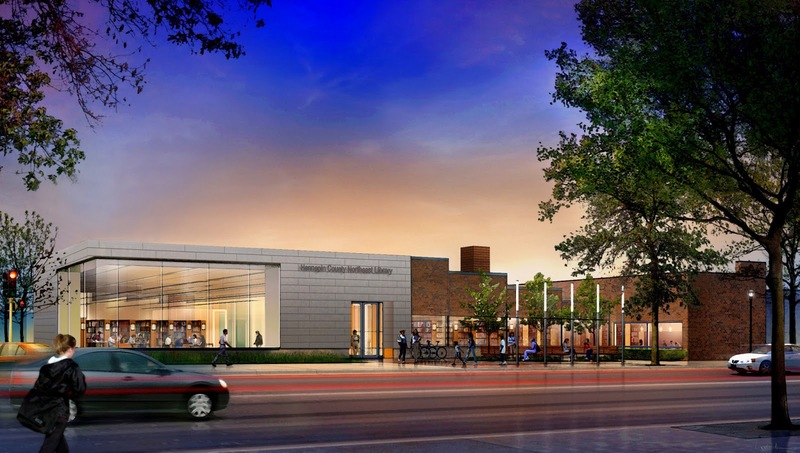 The Northeast Library in Minneapolis is a new, modern, clean building in an interesting and diverse urban area of Northeast Minneapolis. Its static and prepared for the worst qualities are a little hard to judge without knowing just what issues they contend with. But the building did feel safe and clean if a little bland, which could conceivably be because of all their preparation. The library is a place you could hang out in, but with few extra incentives to do so. Casually, and possibly a little unfairly, the staff seemed at least somewhat disengaged, and fairly speaking this time, that was actually borne out in what interactions we did have. To my mind the library is haunted by collection issues that make me wonder exactly what librarians are up to. I find it hard, with all its moderate plusses and minuses here to venture anywhere away from a dead average score. But I am suspecting that is a bit high and reflects on my standard getting slowly crushed down, alas. This was interesting to read. I look for similar things when I visit libraries, but not so systematically. In fact, I don't really "review" libraries, in that I pretty much only report on things I like. I do engage staff in conversations when possible, but rather than ask "library stuff," I tend to ask whether there is anything special about the library that I might have missed. So, very different approaches, but it's fun to know someone else is making similar visits. Thank you for your nice comment! I noticed you look for similar things and that was nice to see. I believe libraries are so fiercely good things, you know, such miracles really, that it can seem a little like reviewing kittens or star shine or something. But I also believe they can be much better too. They deserve to be better, even if they're already wonderful. So I like to look at them in all the many ways they really are. I like to look at everything, really, the way it really is, and I like to talk about it. But yes, and isn't it nice just to go around and see them? You've got vastly the bigger list there than me!